By now, we all know the importance of recycling old computers and iPhones. 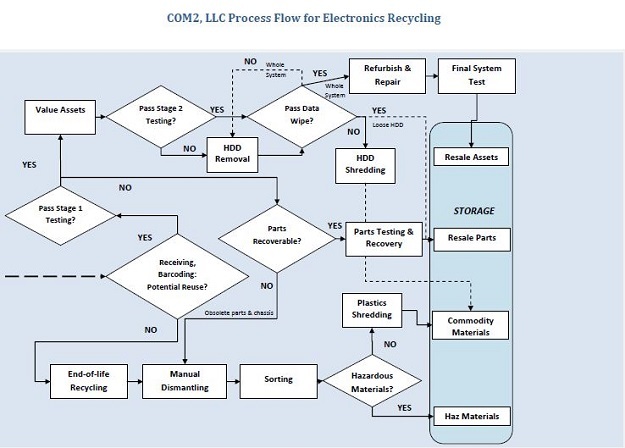 The torrent of e-waste flowing into landfills shows no sign of slowing down, and many states have tried to counter by passing legislation requiring electronics recycling by manufacturers. But what exactly happens to your once-beloved iPod once you relinquish it to the recycling bin? We spoke with three e-Stewards certified recyclers from coast to coast to get some insight into the last moments of our abandoned gadgetry and where our old devices go to die. 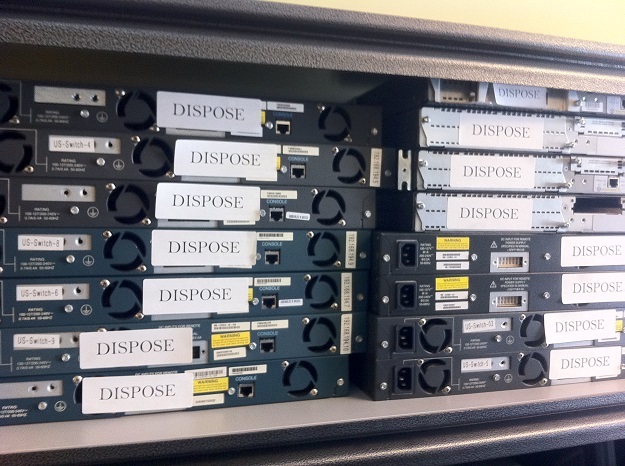 The first thing to appreciate about electronics recycling is the magnitude of operations. It’s big. Really, really big. “We do it on an enormous scale,” said Mark Van Den Elderen of ECS Refining in California. “We have a 260,000 square foot plant in Stockton, Van Den Elderen told us. “It’s just massive.” Imagine bales of shrink-wrapped monitors and heaps of nearly-identical computer towers heaped up to a factory ceiling —enough gadgetry to power a small city. 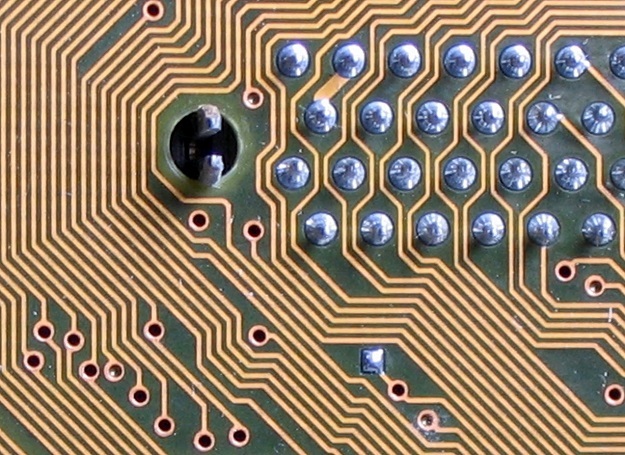 The only high-value perk comes in the form of printed circuit boards: smidgens of copper, silver, gold, and platinum in the circuitry can be smelted off at different temperatures and refined. But the process itself is potentially toxic and produces plenty of worthless scrap, which is why it’s important to look for a recycler’s environmental credentials — or better yet, ask for an audit. So what does this separation process look like? Well, first of all, recyclers exclude overly hazardous materials. No refrigerators, no air conditioners — they don’t want to deal with Freon — and no laptop batteries, which are processed by outside specialists. “It’s bad to have battery acid going everywhere,” said Van Den Elderen. At Vojensky’s Com2 Recycling center, things are still done by hand. “It’s an assembly line,” Vojensky said. “Each person breaks out the parts.” However, the company plans to transition to automated machines soon. Meanwhile, at Van Den Elderen’s ECS Refining, the robots are already in charge. After multiple passes through a crushing maw, the electronics are reduced to a jumble of slivers and fragments. “You want [the pieces] generally the size of a poker chip,” said Van Den Elderen. Afterward, a series of magnets, shaking trays, and optical sorting technologies separate the remnants by the type of material. What’s amazing about separating commodities in this way is that once refined, the components can be re-made into, well, just about anything. Gold from the circuit board in your ancient desktop could theoretically make it into the wedding band you buy for your fiancé. Talk about a circle of life! “[Recycled goods] could end up being made into a new computer, or recycled material that goes into, I don’t know, business cards or a bag that contains dog food; I have no idea,” said Van Den Elderen. While the end results remain a bit mysterious, at least some of the plastics recovered in this process seemed destined for rebirth within some of the newest computers to hit the market. “Our plastics get sent back to the OEM, the original equipment manager,” said Vojensky. Meanwhile, your kitchen walls could be the beneficiary of your old netbook. 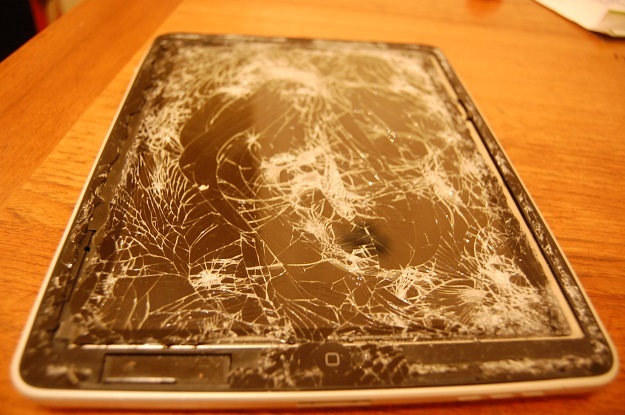 “We have one vendor that’s using glass to put it back into ceramic tiles,” Vojensky added. Of course, as the old “Reduce, Reuse, Recycle” mantra teaches us that re-purposing old electronics does far more good for Mother Earth than the most efficient recycling process ever could. Unfortunately, as New York-based 4th Bin’s John Kirsch pointed out, “Unless it’s an Apple product that’s fairly new, I can tell you, it’s essentially worthless.” There’s no real market for first-generation Kindles or cumbersome CRT TVs. So how do recyclers re-purpose them? 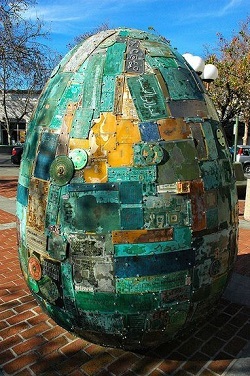 “The circuit boards are popular with artists,” said Kirsch. “One wanted to build an entire park out of them.” Similarly, Van Den Elderen recounts tales of artists who have transformed a computer tower into a greenhouse planter, or assembled metal fragments from their electronics into a coffee table. As we’ve seen recently, they’ve even been turned into ornate carpets. Kirsch’s 4th Bin also partners with film studios at CBS, providing retro-looking computing props for shows such as CSI. CBS gets to skip building models for the set from scratch, and 4th Bin gets the parts back for recycling after shooting wraps — it’s a win-win. Another exciting moment in the business happens once in a blue moon, when a recycler will come across a real antique, especially from residential customers. “We picked up some stuff from the ‘60s from a bigwig at IBM,” said Kirsch. “He was a top programmer. We’re talking 80- or 90-pound desktops.” As primarily a collection agency, as opposed to downstream processors like Van Den Elderen’s ECS Refining, Kirsch’s team comes across plenty of nostalgia pieces. “We’ll get retro computers like Commodore 64s,” he said. Recycling and repurposing aren’t all these companies do. While we at Digital Trends recommend properly erasing your hard drive before turning your computer over for recycling, a big part of the labor at recycling plants involves wiping or flashing every drive that comes their way. It’s an essential security step and necessary to cover their own liability. As e-Stewards certified organizations, everyone we interviewed is held to extremely high environmental and ethical standards. “We have to account for every single item we pick up. Like literally, we have to weigh everything,” said John Kirsch. “It sounds insane, but it’s mass-balance accounting.” According to Kirsch, an auditor will insist, “Y’all just picked up 5,000 pounds, now show me where it went and its end-of-life,” down to the very end of the recycling cycle. 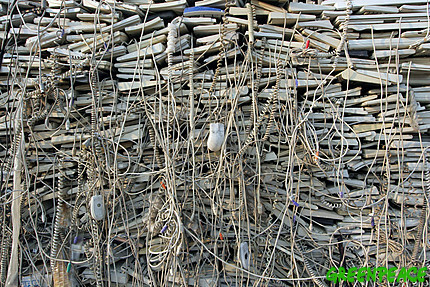 Indeed, according to a 2009 EPA report, more than 80 percent of all e-waste still ends up in traditional landfills. That’s why Van Den Elderen advised, “As a consumer, make sure you know what your recycler is doing with the materials … not only are you keeping precious resources here in the U.S., you’re preventing potentially hazardous materials from being dumped in someone else’s backyard in a developing area.” After all, genuine investment into reuse and recycling is the price we pay for getting our hands on the newest shiny gadget.